Coarctate reactions as a third fundamental organic-mechanistic type. The reaction above is considered as a transfer of an oxygen atom to an alkene with concomitant concerted proton transfer (for the analogous reaction of an alkyne see here). The mechanism is normally illustrated with five arrows accomplishing both operations (see below). But a simple experiment shows this cannot be accurate. When d4-ethene is used (with mCPBA as the peracid) in dichloromethane solution, an inverse kinetic isotope effect of 0.83 is observed (in other words the d4– species reacts faster than the 1H). If the peracid is instead deuterated (as OD) the reaction slows down by a factor of 1.05 (a normal isotope effect). This data provides a good test of whether any transition state model constructed for the reaction is a good one. So how about a ωB97XD/6-311G(d,p)/SCRF=dichloromethane, model, using per-ethanoic acid? The isotope effect can be obtained by calculating the activation free energy with the appropriate isotope specified. 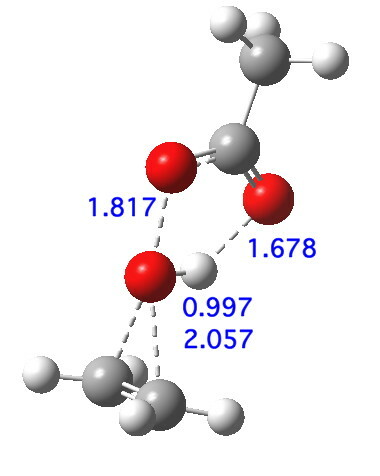 The deuterium isotope effects, on both carbon and oxygen compare very well indeed with those measured (the 13C and 18O have never been measured, they are predictions), which greatly assures that the model is a good one. So the predicted transition state geometry as shown below has had a good reality check. It reveals that two O-C bonds are forming, and the O-O bond is breaking, but that proton transfer has hardly started. This corresponds to the three green arrows shown at the top. The three blue arrows are not yet in action. I have colour-coded them to illustrate this temporal aspect. An intrinsic reaction coordinate shows that the reaction is concerted, albeit asynchronous; the transition state (TS, @IRC=0.0) really only involves the green arrows; the blue arrows kick in only AFTER the ion-pair-like hidden intermediate is formed, labelled HI above (and seen @IRC =+1.2). Stabilising the ion-pair using trifluorethanoic acid (a stronger acid) renders the HI more prominent. As quantum calculations apparently give us trustworthy indications of the order in which events happen during this reaction mechanism, perhaps it is time to start representing this information in our simple schematics. (Some) text-books currently show the left hand diagram below, involving five arrows but with no indication of their relative timing. The right hand side now colours the arrows to indicate that the green precede the blue. An extra arrow is added to indicate that one electron pair is involved in forming a “hidden intermediate”, the green arrow aspiring to end at a lone pair, but the blue arrow then continuing its progress to the final epoxide. The end-point of one arrow representing the start point of another could thus be taken as implying a hidden intermediate. As I have noted elsewhere, the curly-arrow representation of reaction mechanism has hardly evolved over the last sixty years. Some might argue that such stability is appropriate for a very simple heuristic used to teach introductory chemistry to students, and that this very simplicity should not be gratuitously discarded. But perhaps, in the light of what we now know about many mechanisms, it has become over-simple? Could judiciously deployed colour-coding‡ of the arrows be a useful, albeit perhaps only a small step, to upgrading arrow pushing into the 21st century? ‡I appreciate that some people are red-green/blue-yellow colour-blind, and that a full ROYGBIV spectrum of colours may carry too much information! This entry was posted on Sunday, August 25th, 2013 at 8:09 am and is filed under Curly arrows, reaction mechanism. You can follow any responses to this entry through the RSS 2.0 feed. You can leave a response, or trackback from your own site. For completeness, I have included the KIE evaluated for m-chloroperbenzoic acid as oxidant, and have applied a scaling factor of 0.9 to the frequencies (to approximately correct for anharmonicity and other errors). The data citations are: 10.6084/m9.figshare.782244 (reactant) and 10.6084/m9.figshare.781326 (transition state). If you wish to use these to e.g. calculate other isotope effects, download the .fchk file, convert it to a .chk file using the utility unfchk, and re-run the free energy calculation by first reading in the force constant matrix and geometry from the checkpoint file, and then specifying the isotopes you wish to calculate (and the temperature and scaling factor). This is a particularly good example, I think, of the value of citing sharable data.